Robert “Bob” Marley, the Jamaican singer-songwriter, was born on February 6, 1945. He became an international musical and cultural icon who blended reggae, rocksteady, and ska in his musical compositions. He began his foray into the music world as a member of the Wailers, a reggae band that became famous for its distinctive vocal style and song writing. Marley embarked on a solo career when the Wailers disbanded in 1974, relocating to England where he released his album “Exodus” in 1977. “Exodus” was a mega-hit and helped make Marley one of the best-selling artists of all time. Marley followed with more albums and singles that topped charts and sold millions. Fans all over the world viewed Bob Marley through an iconic image that showed him smoking a large marijuana cigarette. Since then, Bob Marley has been associated with the drug. Indeed, marijuana was an integral part of the artist’s persona and music. 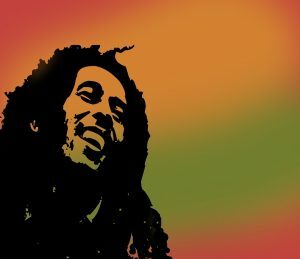 Marley’s association with marijuana could be explained by his practice of the Rastafarian religion. He became a devoted Rastafarian and served as an ambassador for the belief system until he died in 1981. Rastafarianism is a loosely organized religion based on the Abrahamic faith that believes that Emperor Haile Selassie of Ethiopia was the returning Messiah. The belief hinged on ancient Biblical prophecies that Ethiopia was the Holy Land and that the black people are the lost Tribe of Israel. In the Rastafarian religion, the use of “ganja” or marijuana is believed to be a holy sacrament. Followers maintain that the drug is never to be used recreationally but is reserved for religious and medicinal purposes. Rastafarians believe that the drug enhances meditation and helps users achieve greater mystical insights into the nature of the universe. For Bob Marley, marijuana use was not a recreational matter. He viewed marijuana smoking as a holy rite, similar to Catholics taking the Holy Communion or Native Americans using peyote. Marley considered himself to be a holy person and believed that marijuana opened a spiritual passageway to artistry and poeticism.